Pope Francis, who wore the bloodstained rope belt that Romero wore when he was assassinated, canonized Romero and Pope Paul VI at a Mass in St. Peter’s Square before about 70,000 faithful, a handful of presidents and 5,000 Salvadoran pilgrims who traveled to Rome to honor a man whom many Latin Americans consider a hero. Back in El Salvador’s capital, tens of thousands more Salvadorans stayed up all night to watch the Mass on giant TV screens outside the cathedral where Romero’s remains are entombed. 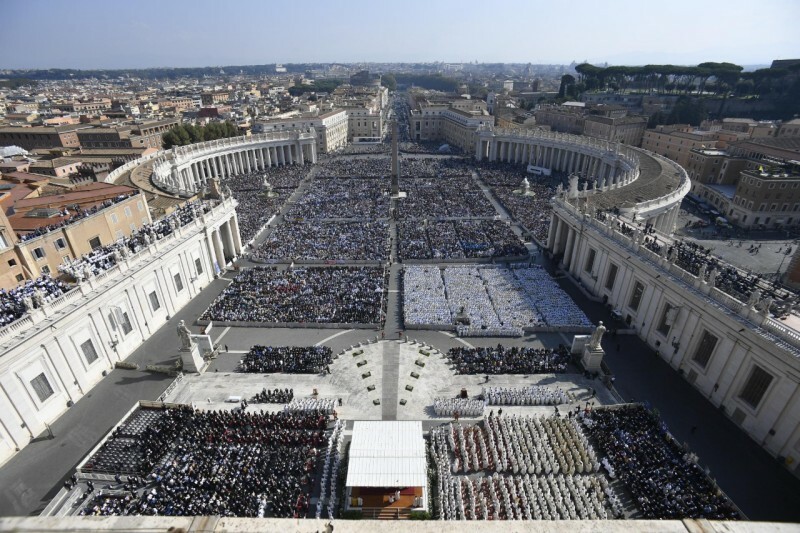 Below are photographs of the crowd at St. Peter’s, Pope Francis and of photographs of Romero and Pope Paul VI hung on the exterior of St. Peter’s. In my first trip to El Salvador in April 1989 I started to learn about Oscar Romero and his courageous denunciations of human rights violations by the Salvadoran government and, to a lesser extent, the rebels. For these acts he was assassinated while he was saying mass in a small, modern and beautiful chapel on the grounds of a cancer hospital across the street from his small apartment. As a Protestant Christian I came to regard Romero as my personal saint. Thus, I treasure the Roman Catholic Church’s formally recognizing him as a saint. Vatican, Bl. Oscar Romero: A martyr of the option for the poor, Vatican News (Oct. 14, 2018); Vatican, Booklet for the Celebration: Holy Mass and Canonizations (14 Oct. 2018); Vatican, Homily of His Holiness Pope Francis (Oct. 14, 2018); Zra, Óscar Romero, Archbishop Killed While Saying Mass, Will Be Named a Saint on Sunday, N.Y. Times (Oct. 13, 2018); Assoc. Press, Pope’s Canonization of Paul VI, Romero Personal, Political, N.Y. Times (Oct. 13, 2018); Sherwood, Salvadoran priest óscar Romero to be declared saint by Pope Francis, Guardian (Oct. 11. 2018); Winfield & Aleman, Pope makes El Salvador’s Oscar Romero and Pope Paul VI saints, Wash. Post (Oct. 14, 2018); Pavoledo, Archbishop Óscar Romero and Pope Paul VI Are Made Saints, N.Y. Times (Oct. 14, 2018). Previous posts have discussed my discovery of Romero and various legal proceedings about his assassination. (See the posts listed in the “Oscar Romero” section of List of Posts to dwkcommentaries—Topical: EL SALVADOR. A website totally devoted to honoring Romero and promoting his beatification and canonization is Super Martyrio. There also are frequent posts about Romero in the blog El Salvador Perspectives. As discussed in previous posts, the Roman Catholic Church on May 23, 2015, beatified Archbishop Oscar Romero after it had determined that he was a martyr, who is someone who was killed because of hatred of his Christian faith and, therefore, who did not have to have committed a miracle for this honor. Such beatification is a necessary, but not sufficient, condition for someone to become a saint of the Church. This papal decree followed the October 2017 unanimous decision by a Vatican panel of medical experts that there was no scientific explanation for the woman’s recovery; the December 2017 approval of that decision by a panel of theologians; and the February 2018 approval of that decision by the Congregation for the Causes of Saints. The Congregation for the Causes of Saints is the congregation of the Roman Curia that oversees the complex process that leads to the canonization of saints, passing through the steps of a declaration of “heroic virtues” and beatification. 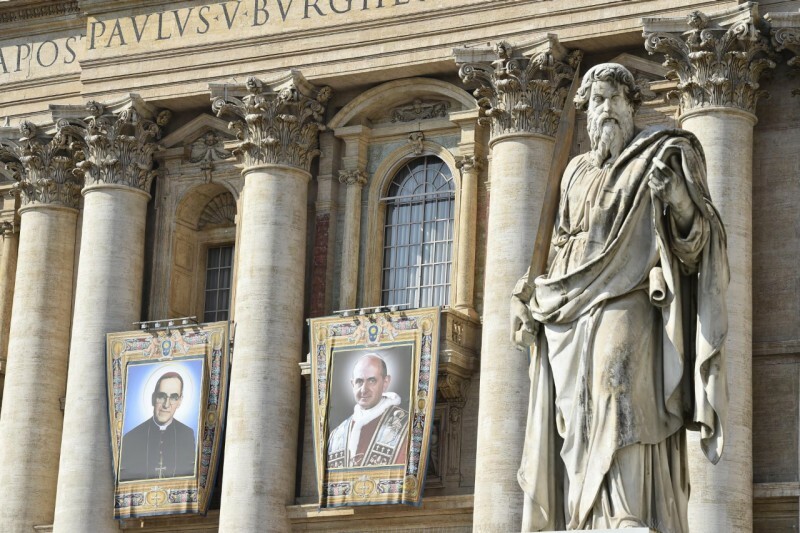 After preparing a case, including the approval of miracles, the case is presented to the Pope, who decides whether or not to proceed with beatification or canonization. In 2016, Cardinal Parolin, under the mandate of Pope Francis, approved the current Regulations for the Medical Board of the Congregation for the Causes of Saints that introduced the necessity of a qualified majority of at least at least 5/7 or 4/6; to proceed to the examination of a presumed miracle. These new rules approved by Pope Francis are designed to make the process for approving a miracle in a sainthood cause more stringent. We now await announcement of the time and place of the canonization. As someone who strives to be a Christian of the Presbyterian persuasion and who already has self-designated Romero as his personal saint because of his courage in proclaiming the Gospel in El Salvador and denouncing its government’s violations of human rights, I am grateful for the Roman Catholic Church’s making Romero’s sainthood official. Previous posts about Oscar Romero are listed in the “Oscar Romero” section of List of Posts to dwkcommentaries—Topical: EL SALVADOR. Here are the ones about his beatification: Beatification of Salvadoran Archbishop Oscar Romero? (May 23, 2013); Progress on Vatican’s Canonization of Oscar Romero (May 20, 2014); Pope Francis Urges Swift Beatification of Salvadoran Archbishop Oscar Romero (Aug. 22, 2014); Comment: Salvadoran Bishops Unhappy with Possible Beatification of Oscar Romero (Oct. 5, 2014); University of Centro America Endorses Beatification of Salvadoran Archbishop Oscar Romero (Nov. 25, 2014); Salvadoran Archbishop Oscar Romero Closer to Beatification (Jan. 19, 2015); Pope Francis Confirms Martyrdom of Salvadoran Archbishop Oscar Romero (Feb. 3, 2015); Additional Details About Future Beatification of Oscar Romero (Feb. 4, 2015); Salvadoran Archbishop Oscar Romero To Be Beatified on May 23, 2015 (Mar. 13, 2015). Vatican, Promulgation of the Decrees of the Congregation for the Causes of Saints, 07.03.2018; Pope Francis approves sainthood for Oscar Romero, Catholic Herald (Mar. 7, 2018); O’Connell, Pope Francis opens the door for canonization of Oscar Romero and Paul VI, America: The Jesuit Review (Mar. 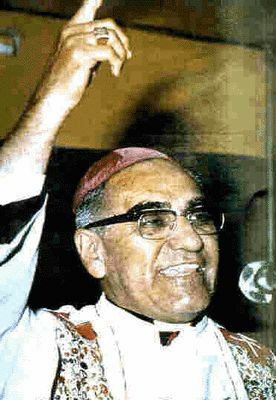 7, 2018); Pope approves miracle for Romero, SuperMartyrio (Mar. 7, 2018); Canonization of Oscar Romero announced, El Salvador Perspectives (Mar. 7, 2018). Vatican, Congregation for the Causes of Saints; Congregation for the Causes of Saints, Wikipedia. As mentioned in a prior post, in October 2009, the Department of Homeland Security charged that General Jose Guillermo Garcia, who had been residing in the U.S. since his retirement from the Salvadoran military, was removable (or deportable) from the U.S. under the Immigration and Nationality Act on the grounds that he had committed, ordered, incited, or otherwise participated in torture and extrajudicial killings in El Salvador. García helped conceal the involvement of soldiers who killed four American churchwomen in 1980. He “knew or should have known” that army troops had slaughtered the villagers, including women and children, in the hamlet of El Mozote in 1981. On December 15, 2015, the U.S. Board of Immigration Appeals upheld and finalized the removal order of Garcia in a decision that has not yet been made public. Whether he would exercise his right to appeal to a U.S. court of appeals was not immediately known. This blog has published many posts about Oscar Romero. This blog has published many posts about the American Churchwomen. This blog has published many posts about El Mozote. Esquivel, San Romero of America walks alongside the peoples of our continent, CubaDebate (Mar. 23, 2015)(English translation by Google Translate). Another Cuban newspaper, Granma, published a shorter article about Romero: Oscar Arnulfo Romero, a saint of the poor of America, Granma (Mar. 23, 2015). Oscar Romero is the personal saint of this blogger, who has written many posts about Romero and who points our that Tim’s El Salvador Blog has published great early photographs of Oscar Romero from the Salvadoran Museo de la Palabra y Imagen (Museum of Word and Image) plus other photographs of images of Romero in today’s El Salvador. (35th anniversary of Romero’s assignation (Mar. 24, 2015). The announcement was made by Italian Bishop Vincenzo Paglia, the Roman Catholic Church’s chief promoter of the Archbishop’s sainthood cause, at a news conference Wednesday (March 11) in the Hall of Honor of El Salvador’s Presidential Palace. Present were the country’s President, Salvador Sanchez Ceren; Chancellor Hugo Martinez; the Archbishop of the City of San Salvador, Monsignor José Luis Escobar Alas; and Apostolic Nuncio, Leon Kalenga. Many believe the March 11th date of the announcement is significant as Grande was murdered on March 12, 1977, and as Paglia in February announced that the Vatican also had opened a sainthood process for Grande. “It is impossible to know Romero without knowing Rutilio Grande,” Paglia said then. 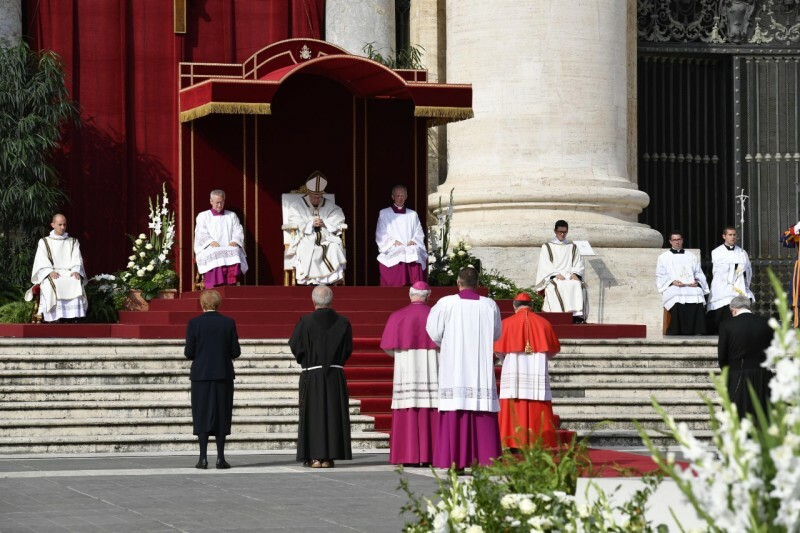 Upon beatification, an individual can be called “blessed” and venerated by a particular region or group of people with whom the person holds special importance. Beatification usually requires evidence of one miracle (except in the case of martyrs). Since miracles are considered proof that the person is in heaven and can intercede for us, the miracle must take place after the candidate’s death and as a result of a specific petition to the candidate. 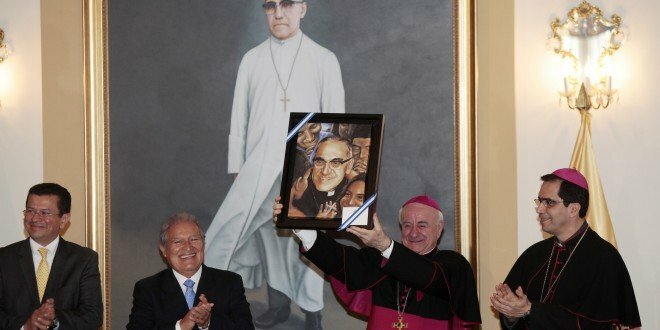 Because Pope Francis confirmed the Church’s finding that Romero was a martyr, there was no need for proof of a miracle for his beatification, but evidence of a miracle will be necessary for the Church to canonize Romero as a saint. Falasca, Oscar Romero will be blessed May 23, Avvenire.it (Mar. 11, 2015); Romero will be beatified in May, SuperMartyrio (Mar. 11, 2015); McElwee, Slain Salvadoran Archbishop Oscar Romero to be beatified May 23, Nat’l Catholic Reporter (Mar. 11, 2015); “The son of a small country in Central America is now placed among the blessed:” Vincenzo Paglia, DiarioCoLatino (Mar. 12, 2015); Vincenzo Paglia: Pope Francis calls us to imitate Romero, DiarioCoLatino (Mar. 12, 2015). There are many posts to this blog about Romero, including Pope Francis’ urging a quick beatification for Romero, Francis’ confirming martyrdom for Romero and additional details about that confirmation. In 2000 I attended a memorial mass in El Salvador for Rutilio Grande, as reported in a prior post. 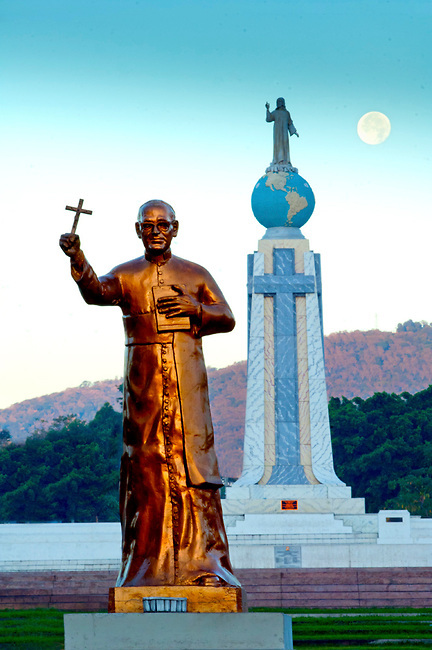 The date of the beatification is being determined by the Vatican, but the place will be the Salvador del Mundo (Savior of the World) monument and plaza in San Salvador, the capital of El Salvador. Archbishop Romero represents total fidelity to the Gospel and to the Church. Archbishop Romero is emblematic of the “New Martyrs”. Archbishop Romero is a model of holiness. Archbishop Romero is a peacemaker. Archbishop Romero challenges us to be a Church that goes forth into the world. Archbishop Romero is a guide for the “preferential option for the poor”. Archbishop Romero challenged all parties to work together for the common good. Archbishop Romero is a great preacher. Archbishop Romero is recognized beyond the Church. Great News! Muchas gracias, Super Martyrio, for your constant and excellent work on this most important cause! This post is based upon Tim’s El Salvador Blog, St. Romero of the Americas (Feb. 3, 2015)(this blog post also has links to sources about Romero); Super Martyrio, At last, a speedy approval for Romero (Feb. 3, 2015)(extensive discussion of the reasons for the long delay in determining martyrdom); Super Martyrio, Ten reasons Romero matters (Feb. 3, 2015). Pianigani, Pope Francis Honors Óscar Romero, Salvadoran Archbishop, as Martyr, N.Y. Times (Feb. 3, 2015), This blog contains many posts about the life and death of Archbishop Romero.